Paiania (or Paeanea Greek: Παιανία, Greek pronunciation: [pe.a.ˈni.a], before 1915: Λιόπεσι - Liopesi, pronounced [ˈʎo.pe.si]; Arvanitika: Liopësi) is a town and a municipality in East Attica, Greece. 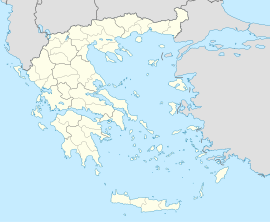 It is an eastern suburb of Athens, located east of Mount Hymettus. It is 11 km east of Athens city centre. Paiania is home to the Vorres Museum of Folk and Contemporary Art, the Foundation European Art Center (EUARCE) of Greece. the broadcasting facilities of Greek television station Oren TV and the former training facilities of football club Panathinaikos FC. Greek National Road 89 passes through the town, Motorway 6 passes east of it. The town was renamed to reflect association with the ancient deme of Paeania. The municipality has an area of 53.155 km2, the municipal unit 43.917 km2. The municipal unit of Paiania also includes the village of Argithea (pop. 1,024). Demades (380-318 BC), orator and demagogue. Demosthenes (384-322 BC), orator and demagogue. Philippides of Paiania (293 BC) , archon Basileus and son of Philomelos. This page was last edited on 9 March 2019, at 17:34 (UTC).